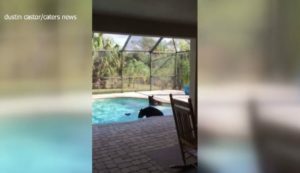 Two bears were caught on camera swimming in a pool at a Golden Gate Estates home. Homeowner Dustin Castor was surprised to see the bears splashing away in his pool when he arrived home from work. His first reaction was to record the bears with his Iphone. “When I walked in the front door, there was one literally sitting in the spa, the other was sitting right here in the shallow end playing,” Castor said. The bears were able to enter through a tear in the pool screen caused by Hurricane Irma. Castor watched the bears from his kitchen window for about 10 minutes before they noticed him and took off. “They were probably bummed I crashed their pool party,” Castor said. As for the broken screen, Castor does not plan on fixing it anytime soon in case the bears want to come back. Experts warn residents should never approach a bear, and should stay inside if there is one on their property.